The traditional explanation of why we get fat is, that we eat too much and don’t exercise enough. Gluttony and Sloth – right? This is of course as true as the first law of thermodynamics, because it is a restatement of the first law of thermodynamics. But it is also meaningless. It is like answering the question “Why Bill Gates is so rich” with “He spends less money than he makes”. People aren’t fat because they eat too much, and exercise too little – it is really the other way around. You eat too much and exercise too little because your fat cells are vacuuming up all the calories first before the rest of your body can get any. The rest of your body thinks it is starving, and conserves energy (doesn’t exercise). It also sends your brain messages to go buy it a Chocolate bar STAT (you get ravenously hungry). Even though you are already eating plenty of food. So why are my Fat Cells such overachievers? Fat cells do this whenever you have high levels of the hormone Insulin. Insulin has many important jobs, but we’re going to focus on just 3 of them here. Telling your muscles to burn Sugar. Sugar and Fat are the 2 primary sources of Energy in your body – most cells in your body can choose to burn either Glucose (Sugar) or Fatty Acids (Fat). So what makes this hormone Insulin go up is eating Carbohydrates (Starches like Bread, Rice, Corn, Potatoes, Pasta and Sugar). It does this because when you eat these foods they are all converted quickly in your gut into glucose. The Body really hates to have too much glucose sloshing about because it’s a high octane fuel that is meant to be burned quickly, not sitting about oxidizing (ageing) your insides. Too much for too long and you will go into a Diabetic coma. So your body produces a surge of the hormone Insulin to deal with it. The following chart shows what happens in the 4 hours after you eat a meal containing Carbs – Glucose (the red line) immediately goes up from it’s normal operating level (the green line) peaking at about 30 minutes after the meal. 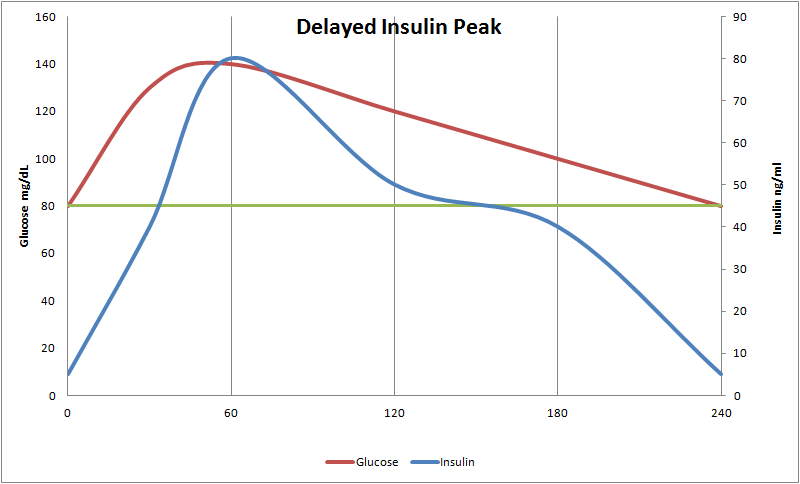 Soon after Insulin levels (the blue line) start to go up to start to work on driving the Glucose into your Muscles. What is supposed to happen is there is a short sharp surge of insulin, it does it’s job, glucose drop to safe levels and the Insulin can drop back to zero and your body can go back to burning excess energy you have stored in Body Fat, and the beta cells that make the Insulin in the Pancreas can rest up for the next time you eat a meal. Why is my metabolism not working properly? For some people Insulin doesn’t buildup as quickly and takes an hour to peak, and this is one of the first signs of malfunction in the beta cells that produce Insulin in the Pancreas. 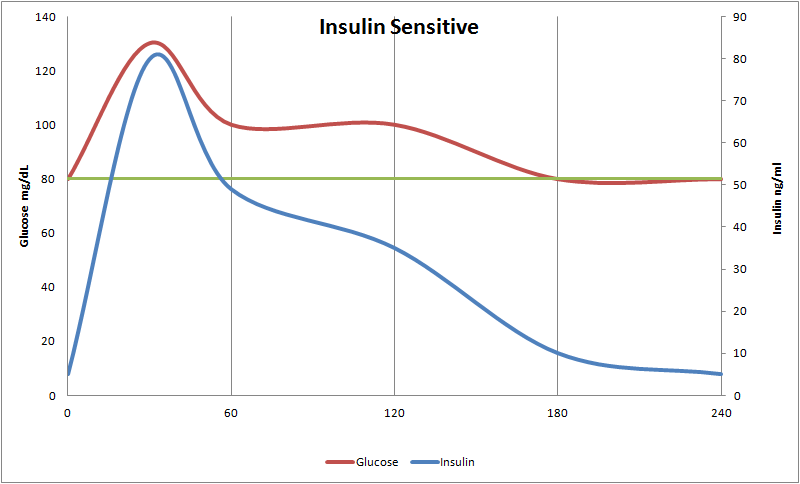 Note that in this chart the glucose curve is similar to the Healthy Insulin sensitive person but Insulin is higher for a lot longer – so those beta cells in the pancreas that make Insulin are working a lot harder. As you age your chance of having this kind of pattern are higher, also for some people your genes will play a large role in how early this will happen for you (for Richard it was 38) , also there are factors in your environment such as how many Carbohydrates you eat, or even your mothers Insulin levels when you were in the womb. We know it can be triggered by high levels of Fructose, so it is possible that this adaptation evolved in Mammals as a way to store massive amounts of calories at the end of Summer for winter hibernation and triggered by the presence of ripe fruits. 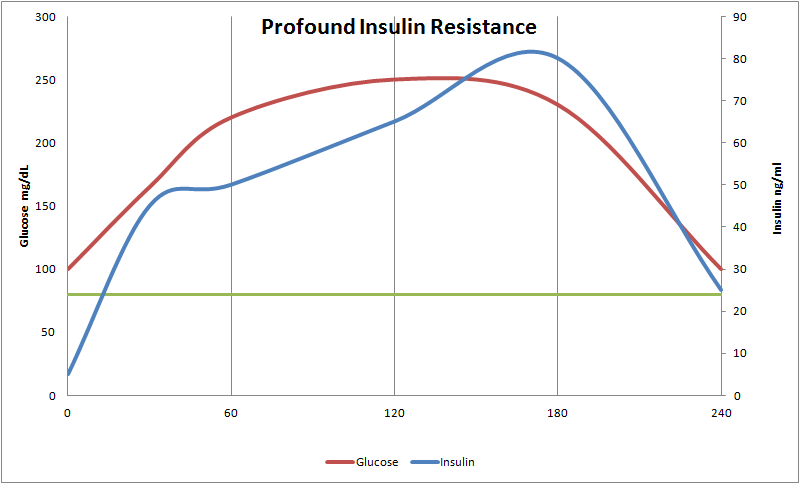 Once Insulin Resistance has started, and you have to produce more Insulin the pattern will likely get worse. The Insulin peak will occur 2 hours after eating , you will produce more Insulin and most importantly there will be so much that when it finally starts working to lower your Glucose – it over corrects and drops Glucose below the level that the body (especially the Brain) likes. This is called a Hypoglycemic event, and the symptoms include intense hunger, dizziness, nausea, weakness, and a compelling desire to buy your brain a Candy bar STAT. 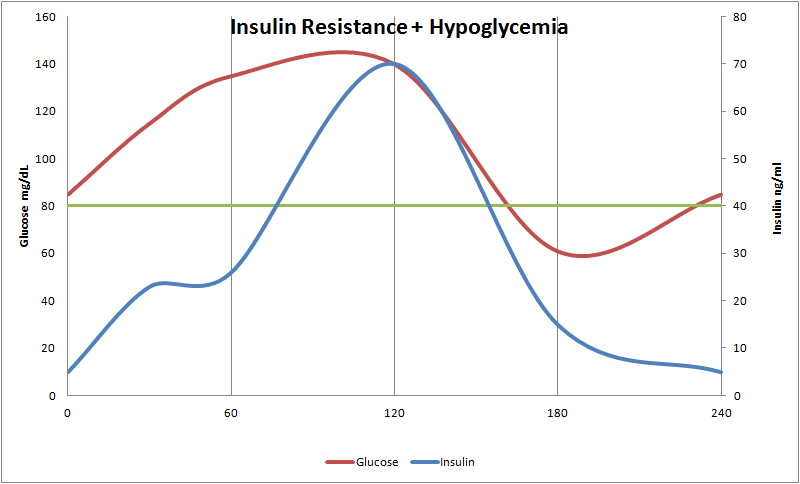 People who are insulin resistant and burning Carbohydrates find that they have to eat many small meals every 3 hours which of course means another Insulin surge. And for that entire time that Insulin is elevated their fat cells are hoovering up all the free fat in the blood, and not letting you burn any body fat. Eventually if this situation goes on for long enough (and we all have different abilities to tolerate this) you will eventually have almost permanently high Glucose and have to produce Massive amounts of Insulin – and your fat cells will never get switched from fat accumulation mode into fat burning mode. The longer you eat those foods the worse the problem will get until you get type 2 diabetes … unless maybe you won the genetic lottery and this isn’t a problem for you. It is estimated that 400 Million humans on the planet have full blown Type 2 Diabetes. It is believed that most Humans have the genetic predisposition to Insulin resistance but don’t live in an environment with Excessive amounts of carbohydrates in their diet that would make their disease progress. And then there are some people who appear to be able to tolerate massive amounts of Carbs without getting sick – For everyone else Obesity is an indication of individuals with a predisposition to Insulin resistance in the presence of abundant amounts of dietary Carbohydrates. And that is why you get fat. Awesome! You should write a book.